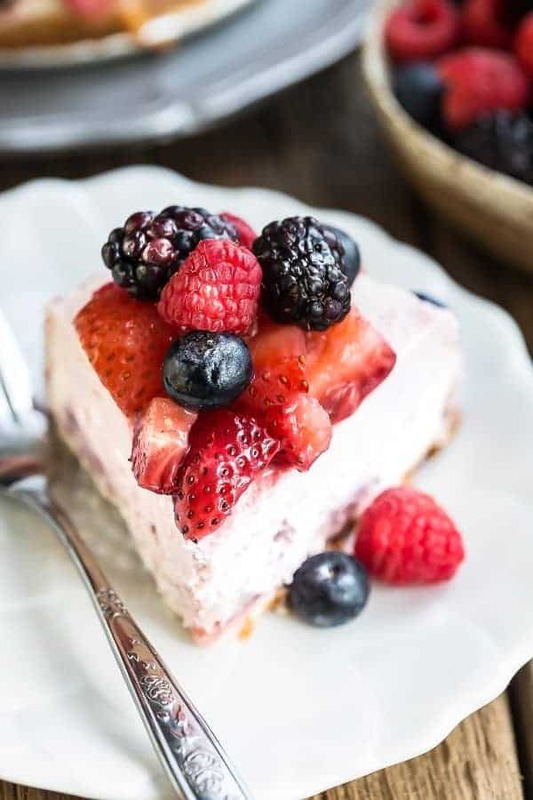 Mixed Berry Cheesecake is the perfect dessert to showcase your favorite mix of triple or quadruple berries. Best of all, you can make this in your slow cooker or oven. 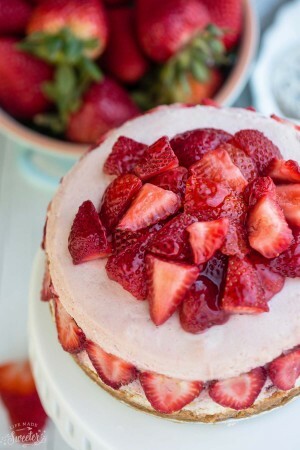 The holiday weekend is finally here and I couldn’t let it slip away without sneaking in just one more dessert showcasing my favorite summer fruit. 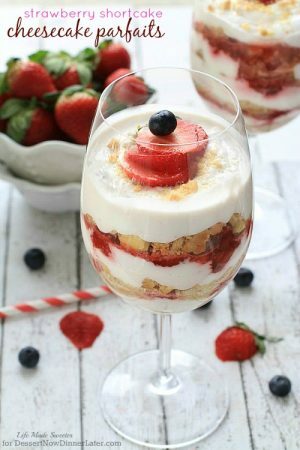 This Mixed Berry Cheesecake is the perfect dessert to take along for a backyard BBQ or to an elegant dinner party. 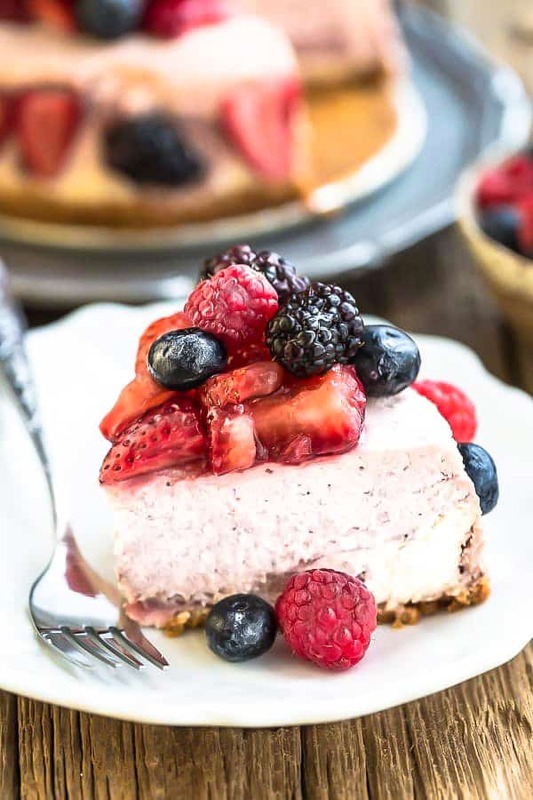 It looks pretty with all the fresh berries piled on top and the best part about this recipe is that you can make the cheesecake either in the oven or your slow cooker. I love using my slow cooker to make desserts during the summer since it doesn’t heat up the house when it’s a bazillion degrees outside! The Mixed Berry Cheesecake starts off with a graham cracker crust that gets pressed into a 6″ springform pan. If you want to make this in a 9″ pan, feel free to double the recipe. 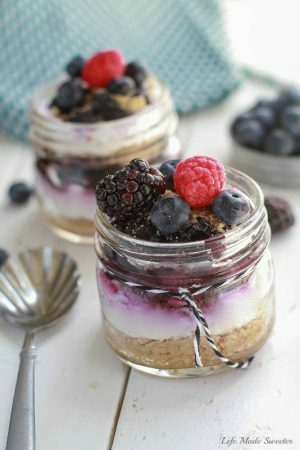 The light and fruity cheesecake filling is made with pureed blackberries, blueberries, raspberries and strawberries. The berries on the sides get pressed on afterwards – I did try putting them on before cooking the cheesecake and although it worked, the color was all washed out and not pretty for pictures so feel free to add the berries on to cook with the cheesecake if you prefer. Just top it off with some fresh berries and brush on the sweet glaze and you’re all set. 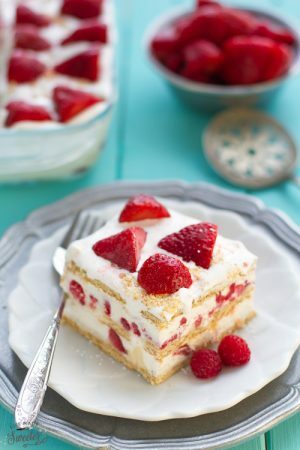 Light, creamy and a delightful summer dessert! Place a 6” springform pan on a large double layer of heavy-duty foil and wrap securely around the bottom of the pan. Preheat oven to 350 degrees. In a medium bowl, combine graham cracker crumbs, melted butter, 1 1/2 tablespoons sugar and cinnamon together. Press firmly into the bottom of prepared springform pan. Place in the fridge until ready to add cheesecake batter. In a large bowl, mix cream cheese and 2/3 cups sugar together until smooth. Add sour cream and mix until combined. Beat in eggs one by one until smooth. Add in pureed berries and mix until smooth. Pour the batter into prepared springform pan. For the oven:Place the springform pan into a large roasting pan and place into the oven. Fill with about 1 inch of hot water. Bake for 35-40 minutes or until the center is almost set. Allow the cheesecake to cool in the oven with the door propped slightly open for 1 hour. Let the cheesecake sit in the oven for 1 hour. Remove from the oven and allow to cool completely at room temperature. Refrigerate for at least 5 hours or overnight. Loosen the cheesecake from the rim of the pan and remove the rim. For the slow cooker: In a large 6 quart slow cooker, place a steaming rack inside or if you don’t have one, make your own by rolling two 24 inch pieces of aluminum foil into 1-inch wide strips and roll together to create a foil rack. Place pan on top of steaming rack or coil inside slow cooker. Place a double layer of paper towels to cover opening of slow cooker then cover with lid by placing lid securely on top of paper towels.Cook on high until cheesecake is set, but slightly soft in the center, around 2 hours. Turn off heat and allow cheesecake to stand, covered, in slow cooker for 1 hour. Cheesecake will set slightly and top will appear dull. Remove pan from slow cooker and cool for 1 hour on wire rack. Refrigerate covered, 8 hours or overnight. Whisk together water, sugar, lemon juice and cornstarch. Place over medium heat and bring to a boil while whisking. Continue cooking until thickened, 1 minute. Remove from heat and allow glaze to cool. Remove cheesecake from fridge. Decorate top of cheesecake with mixed berries and brush with glaze. Serve chilled or at room temperature. Optional: To decorate the sides of the cake: Press berries firmly into the side of the cake, standing up with alternating berries. If they do not stay, brush some glaze on one side and press that side into the cheesecake to stick.